Janie Richardson is a veteran in the real estate field. 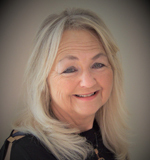 She has been a Realtor since 1977 and has experienced the many changes to the industry over the years. Through each phase, she has enjoyed representing her clients in all aspects of buying and selling from residential to commercial properties. Janie loves Chesterfield County and has spent over 31 years calling it her home. She has many interests including vintage furniture, dancing, and all types of music. However, her favorite pastime is playing slot machines in the casinos!!! In all that she does, from gambling to real estate, she’s a winner. She said that as a young girl she watched her Dad, who was in the construction business, work on homes and it truly fascinated her. Her true love for real estate began when she watched a Realtor work with a family member to buy a home. At that moment she knew that she wanted to be a real estate agent and asked the agent what she had to do to become a Realtor . In addition to her real estate license, she also owns an electrical firm and has a Class A Contractor’s license. Her Dad’s influence has guided her throughout her life, especially when it comes to real estate and the love of her children, grandchildren and a young great grandchild. If you are looking for an agent with love and compassion for the real estate industry and a desire to share that compassion with her clients, then don’t hesitate to give Janie a call.